My mother used to make yummy fruit cobblers, which she served for breakfast as well as dessert. Somehow I misplaced her recipe, but, luckily, while I was testing recipes Rosie's Riveting Recipes, I came across this gem. 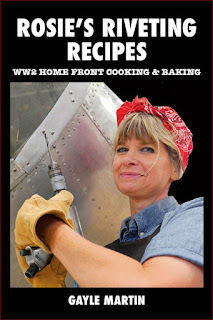 Originally published in my first historic cookbook, Anna's Kitchen, this recipe easy to prepare and it works with either canned or fresh peaches. It also leaves your kitchen smelling absolutely divine. Sift flour once, measure, add baking powder, salt, and sugar; sift together twice. Cut in shortening until it resembles coarse meal. Add milk; stir until all flour is dampened. Drop dough on prepared fruit; spread evenly to edge. Bake in hot oven (425 F) for about 20 minutes, or until crust is nicely browned. Serve warm, with cream or hard sauce. Note: Pitted cherries, apricot halves, or plums may be substituted for peaches. Modern adaptation: A number 2 1/2 can equals approximately 3 1/2 cups. If using canned peaches two 15-ounce cans would be suitable for this recipe. Leftover peaches, if any, can be saved and used as a garnish. If custard cups are not available this recipe can also be prepared in an 8 x 8 inch baking dish. *Most modern baking powders are double-acting.